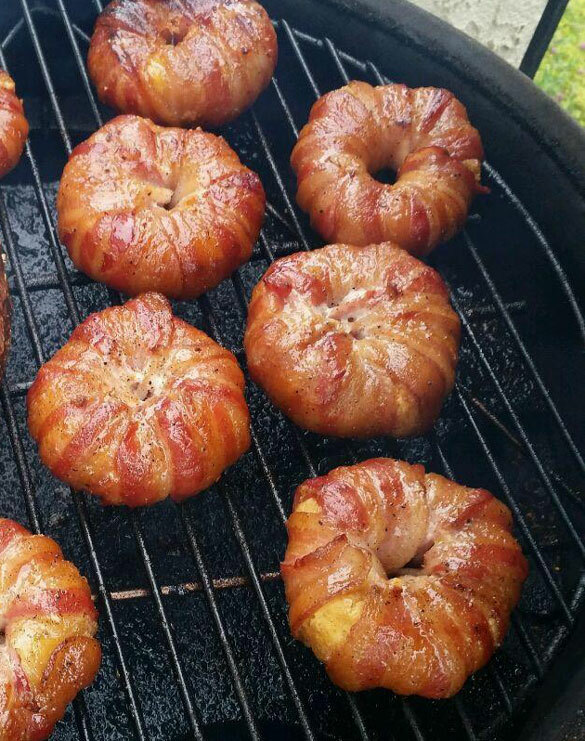 My students have been enjoying bacon wrapped donuts my Saturday classes. 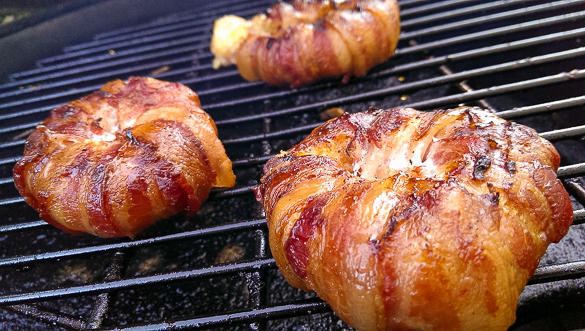 Since the viral popularity of my pineapple mozzarella rings on the Internet, I’ve been adding more bacon wrapped madness to my recipe database. 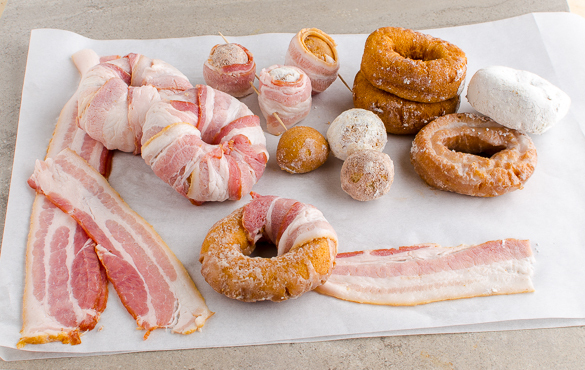 This Doink (Donut + Oink for Pig) recipe joins my many bacon musings including mini frittata, turkey lollipop, apple pie, meatloaf, breakfast fatty, buffalo turds, pig candy, and even bacon-weave animals. 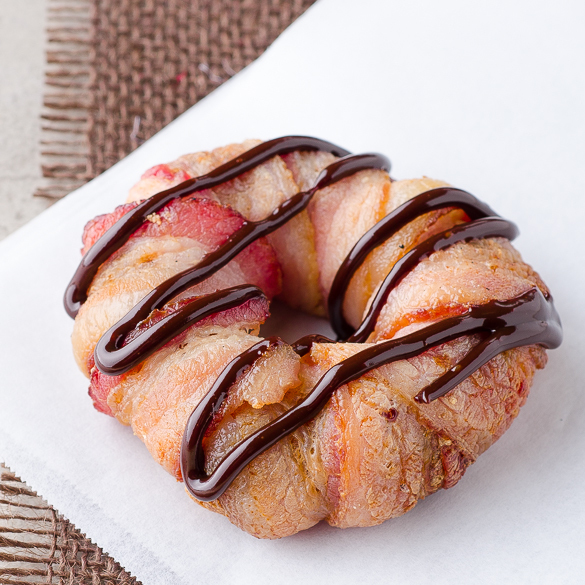 Any store bought donut works work well and I’ve found that the glazed, powdered, and chocolate ones pair well with bacon. What doesn’t pair well with bacon! I’ve assembled a collection of Doinks using both donuts and donut holes. Have fun with these bacon musings. They are sure conversation starters. To minimize breaking the donut ring, I froze them first so there were easier to wrap. Don’t wear gloves as you need nimble fingers to thread the bacon through the hole. If you let the bacon come up to room temperature, it’s more pliable and easier to work with. I like the look of alternating layers of fat and meat so I picked packages of bacon that had even layers of fat and meat. I cooked my Doinks in my Weber Kettle at 400F for better flavor. You can get great results in your oven or broiler. Use a wire rack. 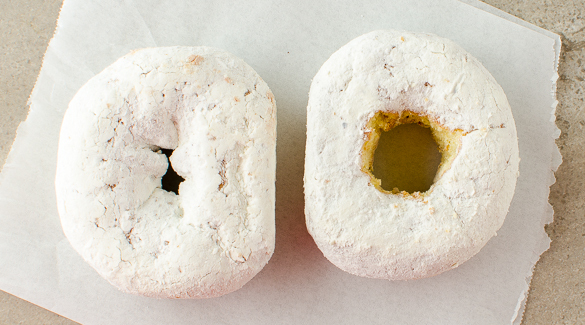 Freeze donuts and/or donut holes. This will make them easier to wrap. If the hole in the donut is too small, use a sharp paring knife to enlarge the hole. 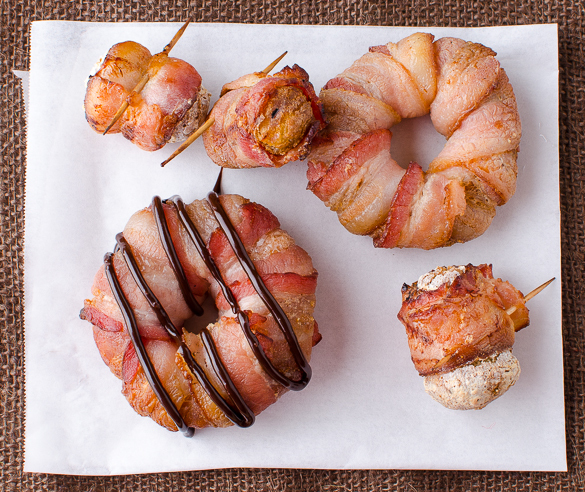 Wrap carefully donuts with bacon slices. 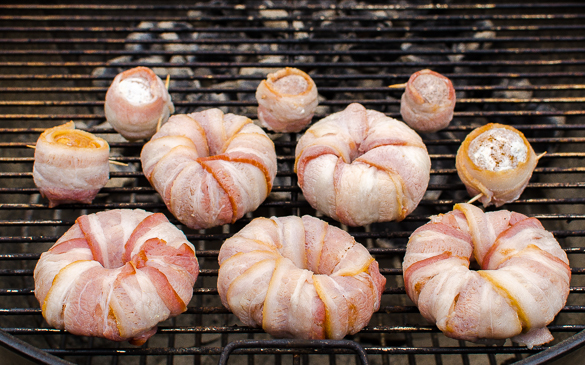 Use a toothpick to secure the bacon slice after wrapping the donut holes. Add SYD rub or salt and pepper to taste. Cook in 400F pit until bacon is crispy, about 20-25 minutes. You can also try a drizzle of chocolate syrup or other favorite syrup that you like. What kind of donuts are you using? Glazed? Cake? Love it! Definitely an ice breaker and a conversational piece at any gathering. I like spicy so the habenero sauce sounds yummy! Gonna try this on the grill this weekend, i think I’m brave enough to attempt!